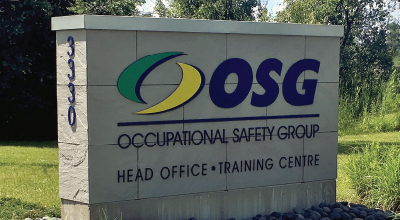 In 1997, OSG’s original founder attended a health and safety training session. He felt that the course was outdated, convoluted, and didn’t easily lend itself to on-the-job application. He decided that health and safety education needed to be engaging, and that training needed to be accessible. In that moment, OSG was born. 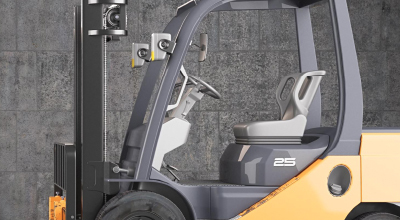 At OSG’s inception, we had three course titles in our health and safety training catalog: Safe Operation of a Lift Truck, WHMIS, and Transportation of Dangerous Goods. In 1997, OSG had two staff members. All of the training offered during this time was delivered on-site. By 1999, OSG’s staff had grown to five people. We operated out of a small office space in London, ON. The first course OSG ever trained was Transportation of Dangerous Goods. Leading into 1999, 100 people had been trained by OSG. By 2000, we had trained over 500 people. That’s a 400% increase in under a year! The number of courses that OSG was delivering continued to grow. Joint Health and Safety Committee (JHSC) Certification Training Part 1, which was the first half of two-part program, was rolled out. In 2002, Aerial Work Platforms, Due Diligence, Safe Operation of Overhead Cranes, and Fall Protection were added to the course library. By the end of 2002, OSG had trained over 5000 workers. By 2002, OSG was offering both classroom and on-site training. Our expansion included two satellite offices with classrooms in Cambridge and Mississauga. Conference centers in Scarborough and Windsor were being used to reach even more clients. In 2002, OSG’s staff head count totalled 12 employees. By the end of 2003, over 12000 workers had been trained. Our JHSC program was very quickly gaining traction in the health and safety market. OSG knew that with only 1700 square feet of office space, further growth would be limited. OSG’s growth in 2003 was monumental. By the end of 2003, OSG employed 19 people, including four full-time trainers. In 2005, OSG moved into its current Head Office at 3330 Dingman Drive. OSG’s owners designed the 5000 square-foot office themselves. t features a 30-person capacity classroom and a state-of-the-art printing and production facility. In 2005, we trained our 15000th worker. 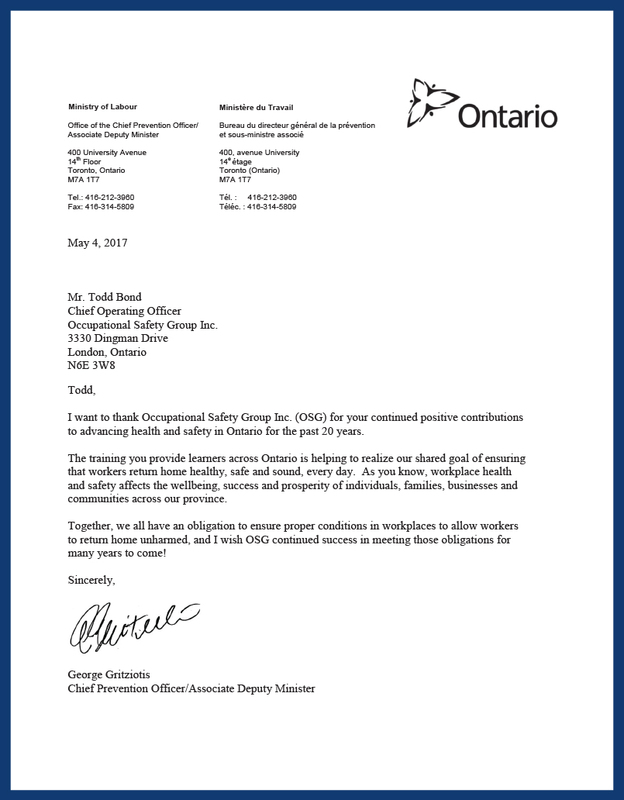 OSG was recognized as Ontario’s largest private health and safety provider, making us the household name in health and safety. Now Ontario’s largest private health and safety training provider, we expanded our reach with classrooms in Sarnia, Owen Sound, Oshawa, and Markham. As the number of classrooms started to grow, so did the total number of OSG staff and trainers. In 2007, OSG expanded to include Ottawa among its classroom locations. Ottawa quickly became one of OSG’s most important markets. The nation’s capital is a bustling hub of industry and business and it associates the OSG brand with excellence in private health and safety training. By the end of 2007, OSG had 34 staff, eight of which were full-time trainers. In three years, the size of OSG’s team had nearly doubled. In 2009, OSG introduced a solution for employers looking for more training delivery options. That solution was an Online Learning Management System, which provided employers with more options, affordable and accessible training, and the empowerment to maintain more accurate training records. The introduction of an online training option was part of OSG’s vision of making health and safety training easy and convenient. In anticipation of the landmark passing of Bill 168 for Workplace Violence and Harassment in 2010, OSG developed and launched a Workplace Violence and Harassment course in 2009. While OSG had been on the road with company vehicles since 2004, it was not until 2010 that the fleet became the recognizable part of OSG’s brand that it is today. By 2012, over 150000 workers had been trained by OSG. OSG’s services were now available throughout Canada, including Calgary, Edmonton, and Vancouver. In Ontario, classrooms in St. Catharines, Vaughan, Brampton, and Barrie were added with great success. Threads of Life is a charity that supports those who have had a loved one become sick or injured at work, or who have lost someone in a workplace accident. OSG participates annually in the Steps for Life Charity Walk. Each year, the OSG team walks in solidarity with people who have lost someone in a workplace tragedy. OSG and Threads of Life share the common goal of workplace safety and having every worker return home safe, every day. 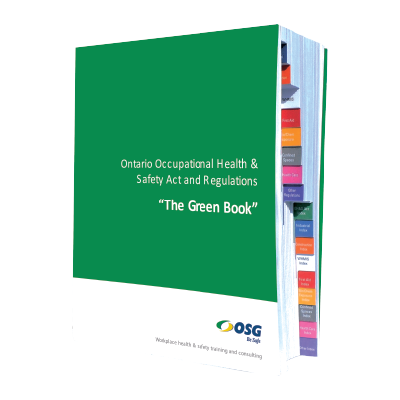 In 2012, we launched our own publication of the Ontario Occupational Health and Safety Act and Regulations, and affectionately named it The Green Book. The Green Book represents OSG’s drive to make health and safety easier and more accessible for everyone. The Green Book features larger fonts, regulation-specific indexing, and an exclusive colour-coded tab system. The unique tabs make finding information simple, fast, and easy. 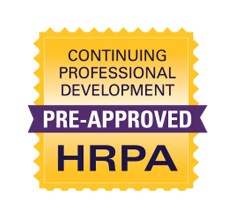 In 2014, OSG partnered with the Human Resources Professionals Association (HRPA) to start awarding Continuing Professional Development (CPD) credit hours for the successful completion of any title in our course library. OSG is committed to making health and safety training accessible to HR professionals at all levels Canada-wide. 2014 marked a year of substantial growth and success for OSG. 25000 workers were trained that year, making the grand total of workers trained by OSG over 200000. In 2015, the Ontario Ministry of Labour (MOL) passed legislation that stated that Working at Heights training and JHSC Part 1 and Part 2 Certification training could only be administered by providers who received approval from the Chief Prevention Officer at the MOL. OSG was among the first private training providers to be approved to train both Working at Heights and JHSC Certification. 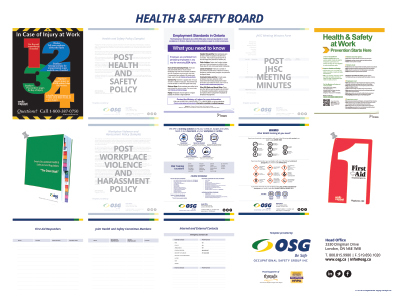 In our quest to make health and safety easy for everybody, OSG developed a health and safety board poster. It is a template that any workplace can use to determine what needs to be on their health and safety boards in order to make remaining compliant with safety communication legislation simple. OSG has trained over 300000 workers. OSG classrooms can now be found in 25 cities Canada-wide. In 2016, the Home Office staff totalled more than 40 staff members, including 14 full-time trainers. OSG currently has over 100 course offerings in a variety of different delivery formats. We offer on-site, in-class, and online training options. Our Train-the-Trainer programs have made training more convenient and accessible than ever before. OSG is committed to innovation and is dedicated to finding training solutions that are tailored to each client’s unique needs. OSG is proud knowing that our training has reached over 300000 workers and has resulted in countless lives saved. There are no limits to where OSG will go from here. Our potential is only limited by our imagination. 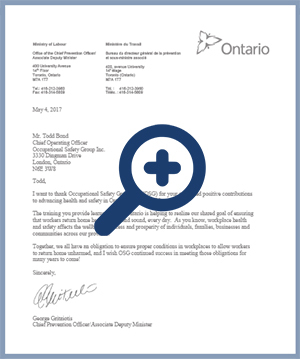 OSG continues the quest to make all Canadian workplaces healthy and safe for every worker, and to make health and safety training easy and accessible. OSG’s employees see a bright future ahead, working for a company that is growing in an industry that is more important than ever. OSG strives to be the kind of company that employees envision a long and successful future with. Our work saves lives, and OSG is grateful for the passion, dedication, and commitment each employee gives to the job. More importantly, OSG would not be the company that we are today without YOU, the valued customer. It is the clients that drive OSG to new ideas, innovative learning and teaching techniques, and advanced customized training solutions. Without the clients and the shared goal to keep all workers safe, OSG could not have grown into the health & safety leader we are today. Be Safe!